We've completed thousands of Energy Audits! Your energy audit will be conducted by a highly-trained and BPI certified home energy auditor. Magic Touch Mechanical is an APS & SRP Preferred Energy Audit Contractor. Magic Touch Mechanical is an approved Home Performance with Energy Star Contractor. Our certified energy auditors have conducted thousands of home energy audits and we’ve been providing audits longer than almost any other company in Arizona. We will thoroughly analyze your home to find out where it is losing energy. We will provide you with the specific details of how to fix the issues, including a detailed report pinpointing the issues. Your report will include information about how much deficiencies found are costing you now. High utility bills – especially during the Summer in Phoenix. Rooms in your home that are much warmer or colder than others. Your air conditioner runs for a very long time during the summer. Too much or not enough humidity inside your home. Drafty areas in the winter. Your home gets dusty quickly. You or your family members get sick often. Your air conditioning and heating ducts or registers (vents) are always dirty. Note: Your home doesn’t have to be old to have some or all of these issues. We test and repair newer homes too. Do You Think Your AC Unit is the Problem? While it’s easy to think your central air conditioner and heating system is to blame for many of these issues, it may be only part of the problem, or not be to blame at all. Even the best AC system will struggle to heat and cool your home effectively and efficiently if your home itself is not holding up its end of the bargain. Our BPI Certified Building Analysts are experts at finding and prescribing a permanent repair for these problems. 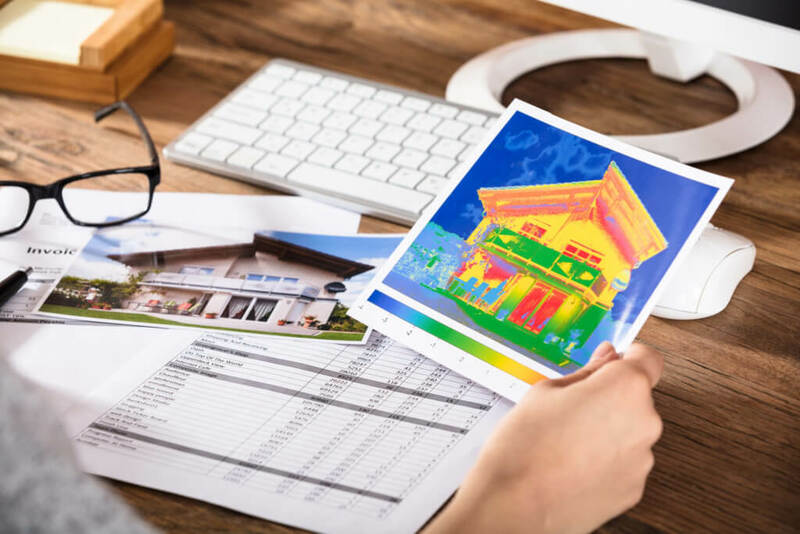 Our Energy Auditor uses sophisticated testing equipment, including thermal image cameras, duct leakage testing equipment, manometers for testing duct & building pressure, and home air leakage testing equipment, to test all aspects of your home. We then literally climb through your attic to physically inspect and photograph your home’s insulation, ductwork, venting, fans, and combustion appliance vents. No stone is left unturned – and we have fixed thousands of homes over the last two decades. Whether it is due to leaky air ducts, subpar insulation, outdoor air infiltration, solar heat gain, or other culprits, you can count on us to find it – and present a solution to solve the problem(s) entirely. The results we deliver are; you and your family being more comfortable, breathing healthier air, and having lower power bills. How can we be so confident in that? Just read the hundreds of online reviews from clients we’ve done just that for! What Do All Those Tests and Tools Determine? When your energy auditor comes to your home, he’ll run the building through a series of tests to see how well it is heat–sealed and how airtight it is. One of the standard tests he will conduct is a blower door test. We use a blower door to lower the air pressure inside a house, which causes air from outside to rush in through any air leak in the building. Our Energy Auditors use this information to determine exactly where your home is leaking and how much. We then use that information to determine what work needs to be done to seal up your home. Other work that the auditor will do in your home is use thermography—scanning with infrared devices—to see where heat can escape the home or enter it. The inspectors will look over wall and attic insulation, the ductwork, and the heater and air conditioner to spot places where energy is lost or appliances are working inefficiently. Upon completion of an energy audit, the professionals will provide you with a breakdown of the energy problems the house has, as well as specific requirements to fix them. We’ll even help you prioritize what work should be done immediately, and what work can wait or even be disregarded. Magic Touch Mechanical is ready to help get you started with better home performance starting with a comprehensive home energy audit. We’ll answer all of your questions about places where you can improve energy efficiency, and offer ideas for solutions. We even provide many of the home improvement services your home may require. Our home improvement services include; duct sealing, home air sealing, installation of new insulation, window shade screens, HVAC service and replacement, duct design, installation, and cleaning…and more.